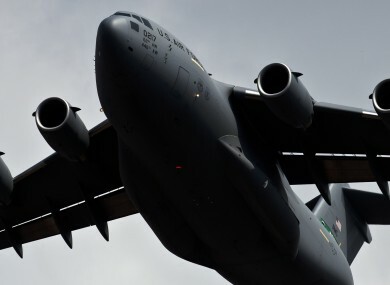 AN ARMED US military aircraft landed at Shannon Airport early this month in breach of government rules that prohibit planes carrying weapons from landing in Ireland. An administrative error is being blamed for the incident. In response to a parliamentary question by Labour’s Derek Nolan on landings at Shannon Airport by foreign military aircraft, the Tánaiste Eamon Gilmore said that he was aware of one landing. I am aware of one landing at Shannon Airport during the period in question in which a US military aircraft, contrary to notification, was found to be armed with a fixed weapon and did not, therefore, comply with the normal conditions that apply to foreign military aircraft overflying or landing in Ireland. Gilmore said that it was raised “at the highest possible level” with the US Embassy. He said an embassy official explained that it was an isolated incident that had taken place as a result of an “administrative error”. Gilmore said he had been given assurances that it would not happen again. For years now Shannonwatch have been asking for proper inspections of US military planes at Shannon, and this admission by Minister Gilmore vindicates our demands. Regular and routine inspections are now required until such time as the US military use of the airport is finally ended. It’s hardly surprising that the world’s largest and most sophisticated army had a fixed weapon on one of its aircraft. But it’s hard to imagine it happening accidentally or in error. Gilmore added that there had been 366 landing by foreign military aircrafts this year up to September 2013. The US military has by far the most military landings at the airport. Here is a breakdown of those figures. Email “Armed US plane landed at Shannon 'in error'”. Feedback on “Armed US plane landed at Shannon 'in error'”.